There are number of possible ways to control rabbits but the one that works the best is exclusion. Probably the most long-term, effective way to protect plantings from rabbit damage is to build a fence. Poultry netting (chicken wire) supported by light stakes will provide adequate control, although the mesh size should be no larger than 1 inch in order to exclude young rabbits. Use 48-inch-tall wire, and bury the bottom at least 6 to 10 inches into the ground. Bending a few inches of the fence bottom outwardly will further deter rabbits from digging beneath it. If you don’t bury the bottom of the wire fence, you’ll need to stake the bottom edge to keep rabbits from passing beneath it. Use tight-fitting gates with sills to keep rabbits from digging below the bottom rails. Keep gates closed as much as possible, because rabbits can be active day or night. Inspect the fence regularly to make sure rabbits or other animals haven’t dug beneath it. You can use reusable fence panels instead of a wire fence. Construct a wood lath or PVC frame 24 to 30 inches high. You can vary the length of the panels to match the size of the garden or area you want to protect. Attach 1-inch mesh wire to the frame, then wire the panels to lightweight, temporary fence posts. The low panels allow easy access for gardening, and you can move them when needed. Cottontails and brush rabbits won’t jump a 2-foot fence. 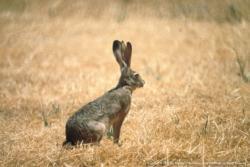 Jackrabbits ordinarily won’t jump a 2-foot fence unless a dog chases them, or they become otherwise frightened. Discourage jumping by increasing the above-ground height to 3 feet. In snow areas, a higher fence might be necessary. Remember, once a rabbit gets into the fenced area, it might not be able to get out.